Allowing you to hunt like a wolf, the Lone Wolf Alpha II is truly the benchmark by which other products in its class are assessed. This is a favorite tree stand for avid hunters who need nothing less than success one hunting season after another. 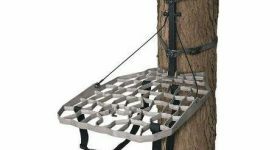 Read on to find out why this particular tree stand continues to be popular in the hunting scene. 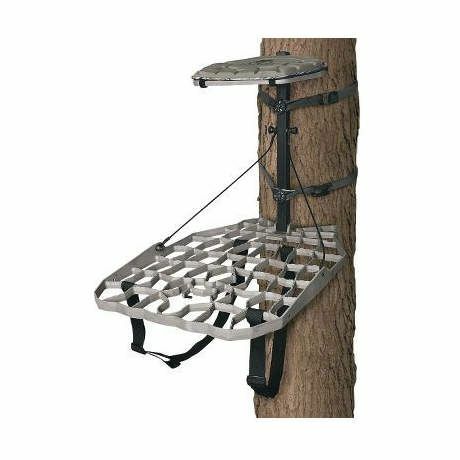 Lightweight at an incredible 14 pounds, this tree stand can easily be carried to and fro as you search for the perfect tree on which to position the unit. This tree stand won’t weigh you down and is easily portable, making it a perfect piece of equipment to bring along with the rest of your hunting gear, especially when you have to walk far to get to the perfect spot . The bareboned frame enables easy storage as well, as its components won’t take up too much space. This tree stand is easy to set up because of its basic configuration so you can install it and immediately start waiting for the deer as you sit undetected high above the ground. Equipped with just enough room to keep you comfortably seated on the platform, this tree stand lets you settle into a good position while waiting for that dream buck. The huge 30-inch by 19.5-inch cast aluminum platform offers generous space for you to move around as you visually explore the area to get the perfect opportunity. The platform and seat have convenient self-leveling capability so you can position the tree stand to the perfect height off the ground with ease. The product comes with a unique E-Z Hang Hook accessory that enables you to select from multiple stand locations at which to hang the unit quickly and effortlessly. This tree stand is made deadly quiet to promote the perfect stealth hunting atmosphere. Move about on the platform without disturbing the peacefulness of the wild so you can really lie in wait quietly to take a fantastic shot. The seat pad is built with large contoured foam to enable you to sit comfortably without hurting your bottom. The seat measures 14 inches by 22 inches so there’s always enough room to change position or move around. The seat can be adjusted to a full 21 inches so you can achieve good visibility of the surrounding area. This tree stand beats having to climb a tree in the wilds any time. It offers a perfectly flat surface so you can have a stable space to aim and shoot. The fascinating 3D camo platform design keeps the product well hidden among the limbs and branches of the tree, keeping you undetected and virtually unseen on the tree. You can place your bows in the convenient in-cast bow holder, which can handle most parallel limb bows. You won’t have to be stuck with the same tree throughout the entire season, as this tree stand is made to fit trees of varying diameters from 4 inches to 22 inches maximum. The tree stand may look basic in structure, but it offers an awesome 350-pound weight rating to support burlier hunters. Truly, big things come in small packages for those who designed this tree stand, which also comes with backpack straps for problem-free transport and carrying. You can also purchase padded straps at your option. Do not be misled by the small, compact and virtually ‘naked’ profile of this tree stand, as it is designed with your safety in mind. The unit comes with a reliable 6-point Fall Arrest System (FAS) that has been subjected to testing to ensure that it meets industry standards. This means it can provide more than enough support for the weight rating it is designed to carry, giving you peace of mind. Use it from one point of the hunting season to another with confidence, as it is constructed of premium quality materials to give it the toughness and rigidity that the hunting activity demands.